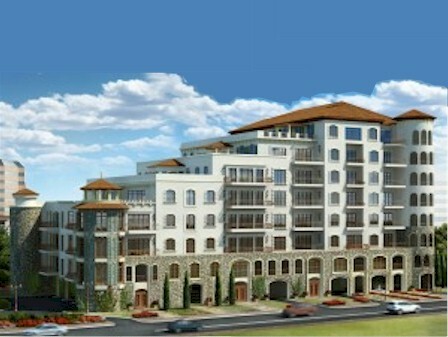 Should be a great building right in Preston Center and near the Park Cities and Preston Hollow. Let’s hope they make it. I stopped by the sales office an early April and its being finished out. I spoke to Randall Davis, the developer, at an event at the Sales Center and he said the patterned the style after Highland Park Village. As of mid-May they are 25% pre-sold and will break ground at 50%. Mr. Davis estimates move-in in 2 years. They are still offering “deals” at the Sales Center, which is set up behind the CHASE bank drive-in tellers. Terranova really pulled out the stops on Thursday night, Sept 24th, with food by PRIME, tastings of Italian wines and favors by Bachendorfs. Developer Randall Davis and his team of architects and marketing staff were all present and it was a lively group of potential buyers and realtors. Davis said there are too many “fence sitters” in this market and prices will never be better nor interest rates lower. Sorry but Terranova has not succeeded in selling a sufficient number of units. Dallas News of 12/2/2011 reports Hines to build an office building here.